Each year representatives of tribal nations of Arizona and the United States, such as the Hopi, Diné, Akimel-Au-Authm and San Carlos Apache, come together to present musical performances and dances as well as share stories and cultural information at Native Trails. The performers may vary from year to year and even from week to week. 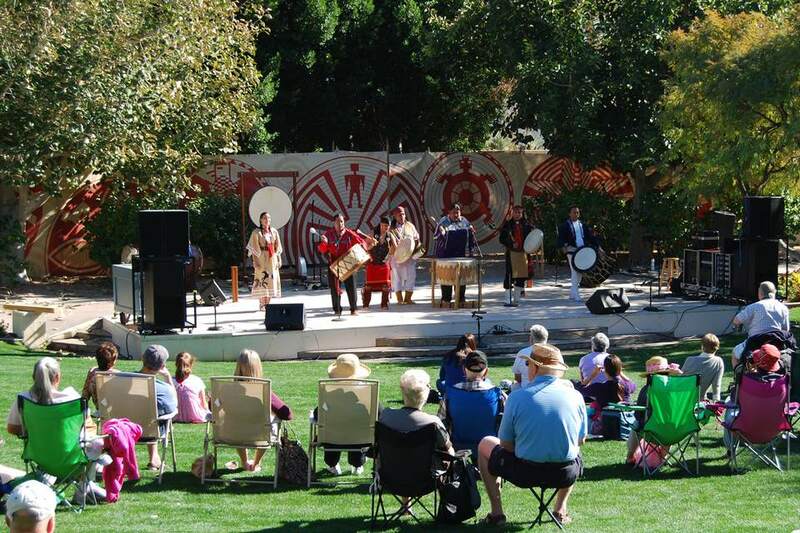 Flutes, drums, tribal dances, hoop dancing, colorful costumes -- the purpose of Native Trails is to introduce us to Native American traditions and principles in an entertaining outdoor performance. Native Trails is presented by the Fort McDowell Yavapai Nation, is produced by the Scottsdale Center for the Performing Arts, and is presented each year free of charge. These performances began in 2003. On average, more than 300 people attend a Native Trails performance. They stand, bring blankets and picnic lunches, bring folding chairs, sit around the perimeter of the amphitheater area or enjoy lunch and a beverage at AZ88 on the patio. Native American artisans, jewelry makers and food vendors may also be on hand offering their products for sale. Page 1: Native Trails: What Is It? Locals and visitors looking for an authentic Native American experience will appreciate Native Trails. Who should attend Native Trails? What do you need to know before you go? Here are some tips about attending Native Trails. Native Trails takes place outdoors. There are no chairs set up for Native Trails. Spectators watch from the grassy area in front of the amphitheater. Bring lawn chairs or a blanket. There are a small number of picnic table/non-grass seats around the perimeter of the amphitheater area. If it is sunny and warm outside, get there early for shady spots under the trees. If it is a cool day, opt for the sunny side of the spectator area -- it will fill up fast! Bring food, snacks, beverages. There may be food vendors here. Native Trails lasts about one hour. Bring a camera! The performers don't mind if you take pictures. Bring the kids! While there is some narrative description of the cultures and traditions, most of the program is focused on music and dancing. Children will enjoy it. You can attend more than once! The program does change a bit from week to week. Not into sitting on the grass and bringing a sandwich? If you get there a little early you can enjoy the program from a little farther away at AZ88, where they have several tables that face the amphitheater. Order appetizers, lunch and/or cocktails. Sorry, but they don't take reservations. Native Trails takes place at the amphitheater at Scottsdale Civic Center Mall, just outside the north entrance of the Scottsdale Center for the Performing Arts. You can't see the amphitheater or the address from the street. See a map and directions to the Scottsdale Civic Center Mall. There is free parking at various parking lots in this area. The closest parking lot is the one off 2nd Street on Wells Fargo Avenue. Park on the north side of the lot and walk between Pepin and AZ 88. You're already there! If you are taking the Scottsdale trolley use the Downtown Route and get off at Brown Avenue. All performances begin at noon and end at about 1 p.m. There is no charge to attend Native Trails. It is free for everyone. For more information visit Native Trails online. It's Summer. Time for the Glendale Summer Band!